We clean the floors often but how often do we REALLY clean the floors completely? Even though we are washing the floors a lot of the dirt gets stuck or it stains the grout making it look so dingy and dirty! 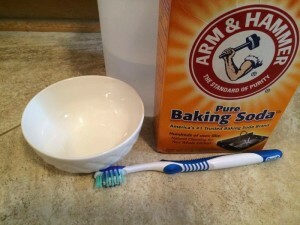 There are just a two ingredients and two tools you will need! All you are going to do is make a paste. I decided on a snow day that I would clean my grout in the kitchen so I made a large batch. 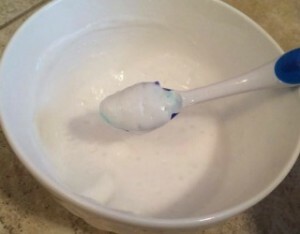 But all you need to do to make this paste is to put about 1/2 a box of baking soda in a bowl and then pour the hydrogen peroxide in the bowl slowly! Start off with one ounce at a time until you get a good thick paste that is still able to spread! 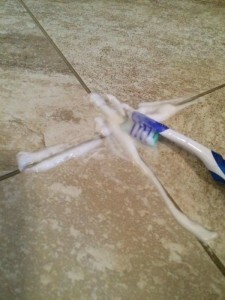 Put a good amount of the paste on your brush and cover the grout completely. No need to start scrubbing. 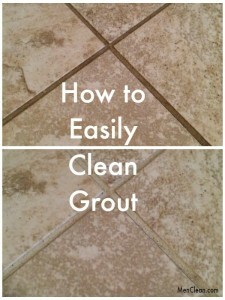 Let this paste sit on the grout for about 5-10 minutes. This gave me enough time to just cover the whole kitchen then I just came back around scrubbed the grout throughout the whole kitchen then I hand washed all the floors to clean up the paste, leaving my floors looking better than ever! If you don’t have these ingredients on hand here are a few other options you could try.